We Indians live, eat and sleep cricket and hence we would have come across many wonderful cricket commentators. There are the likes of Tony Grieg who talk about ear-rings. I personally love to listen to Tony Grieg when Sachin is in the middle. The husky voice of Richie Benaud and his knowledge on the game amazes me. I also admire Geoffrey Boycott to some extent. He has a good sense of humor. But he seldom listens to his fellow commentator. Talking about commentators who doesn't allow anyone else to talk, the only person who comes to my mind is Sidhu. When he entered the scene as a commentator, he was an inspiration. I was amazed by his one liners. But as days went by, he became a pain in the commentator box. He did not even allow the cricketers to play normal cricket. Now he is no more in the commentator box and all of us can breathe freely. Then there are the digital commentators who speak in computerised voices; like some of the West Indian commentators. (In fact all of them). Then we have the big list of dustbin commentators. Sanjay Manjrekar, Venkatesh Prasad, Maninder Singh, Kapil Dev, Waqar Youniz and the list goes on and on. Harsha Bhogle with his IIM skills and conversation skills made a huge impact inside the commentary box with his trivia sourcing and talking skills. But IPL and hair implants spoilt him. He now speaks like a clone of Rabri Devi and Anna Hazare. I am not gonna talk much about all these guys. This post is specially dedicated to the genius of Ravi Shastri. When he was a player, he bowled spinning deliveries that were dispatched out of the park. As a batsman he holds the world record for scoring the maximum number of boundaries in the third man region ( Edged past the keeper). Now as a commentator, he is solely responsible for all the diseases in India. He appears on the television set as though he is gonna say something brilliant. He sets up his tone and tunes it to a husky pitch and ends up saying something stupid. Some of his one-liners are posted here along with Chronicwriter's comments. We can all see that on TV too. 4. Goes for the big one. When ever he says this line, the batsman gets out. I seriously doubt Shastri's intentions behind the above statement. 6. Makes good use of his height. I would have agreed to this line , if only the batsman was someone other than Parthiv Patel. When Munaf bowled a slower ball, the ball pitched on the crease twice before it reached the batsman. Ravi must have been sarcastic with that line. 8. As Dimitri Mascarenhas was bowling his 4th over in a 20-20 match , Ravi contemplated “I wouldn’t be surprised if Warne gets him to bowl his entire quota in one go”. In a 20-20 match the 4th over is indeed the last over for a bowler. Why does he get the feeling all the time? They are the only two overs left in the match. 11. None of the bowlers in this stage of the game is going to go down to the wire. 12. None of the bowlers in the batting team is setting the cat amongst the pigeons. There can only be one Navjot Singh Siddhu. Be yourself. Don't try to become a Siddhu. 13. 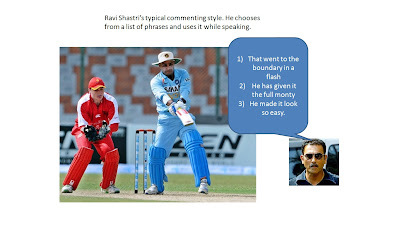 Check the following picture to see a typical Shastri commentry technique. He chooses from a list of phrases and uses it while speaking. Different forms of the game should have different types of commentators. Test Cricket should have robotic speakers and the limited overs format should have guys who can spice it up. All of us know that Ravi is a a total blunder boy in the commentary box. But still we need the services of blunder boys , because without them the game would be very boring. And to add to his already stale commentary, he will pick fights with other accomplished players (hussain) who just want cricket to become an even better game. Not just shastri, even guys like gavaskar, etc shouldnt be allowed to commentate - thats not their primary skill. Their primary skill is on the field, which no doubt they are excellent at. Agree with your division of commentators point. Test - have someone who knows the nuances of the game (preferably have representation from all departments of cricket), ODIs and T20s - have color-commentators like whats there in the major leagues in the US. "He's seeing that cricket ball like a football." Apparently, Gabriela Sabatini forgot him because he "went" like a tracer bullet. I’d should take a look at with you right here. That's not something I normally do! I get enjoyment in reading through a submit that will make people believe. Moreover, many thanks for permitting me to comment! I feel the writer is trying to be funny while he is not, at all. Taking dig at Ravi Shastri is old and is doing rounds on the internet since forever now. I think you need to look at the cricket in more detail. You can start by watching more cricket maybe not just IPL where you seem to get all the jazz from. For inspiration maybe you can start reading Andrew Hughes blog on CricInfo and realise how acute observation he has on the game while you sir on the other hand are stuck in vagueness.